If you missed last night’s ComiCenter show with me on the panel, you can see a low-res video here. An HD version will follow. And just in case I came across as a total superhero hater on last night’s show, I’ll take this opportunity to announce that I am contributing something for the second issue of Rocket Boosters, a fanzine celebrating the Marvel Comics character Nova the Human Rocket. The issue will also feature contributions from Marvel Comics writers, artists and editors who have worked on the character over the years, as well as a previously unpublished story. The electronic ‘zine is edited by Doug Smith, who runs the wonderful Nova Prime Page. I also contributed a little something for the first issue from a few years ago, which you can download as a PDF here. I was very lucky to contribute to the first RB when I did the comic strip “Message Home”. It was a very enjoyable experience doing something for my fellow Nova fans and Doug’s done his charm to entice me to do a few things for this second edition. 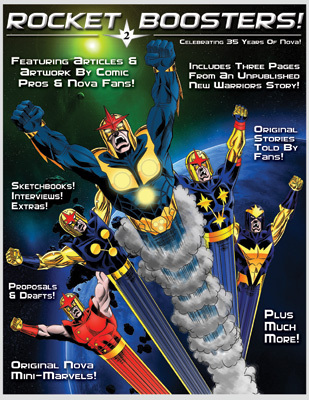 However…doing that strip has lead to other things…I now do the Nova619 webcomic which is produced by a team of Nova fans all over the globe which is released every month at Nova Prime Page, Cosmic Book News and my own site at Deviant Art. Check it out and if you’d like to suggest a few ideas .more than welcome!